Apple iPad Air and iPad Mini with Retina Display: Do They Live Up to the Hype? As anticipated, the tech giant released two new slates this month. As the majority of gadget enthusiasts are already aware of, late Q3 to early Q4 is the timeframe when Apple makes its biggest annual announcements. Both the iPhone 5s and 5c were unveiled last month, alongside the new iOS 7 operating system. But the story did not end with the announcement of these two smartphones, and Apple kept us eagerly waiting for its new tablet line-up until very recently. Needless to say, the Cupertino-based giant has lifted the curtain on the new iPad series, consisting in the so-called “iPad Air” and the “iPad Mini with Retina display” (unofficially known as the iPad 5 and the iPad Mini 2, respectively). Interestingly enough, a new version of iOS 7 has been announced as well. We’ll discuss a bit more about the new update later on, but for now, let’s see what the new tablets have to offer. Just as the rumors and numerous leaks have suggested before, the iPad Air (formerly referred to as the iPad 5) adopts the overall design language spoken by the iPad mini. The device is 7.5 mm thin, arrives with a narrower bezel and has the same speaker/button/jack placement as the iPad Mini. The rumors, however, were wrong when it comes to the Touch ID sensor that was expected to replace the slate’s home button. In reality, neither the iPad Air nor the new iPad mMini possess this new feature. Moving on to other hardware details, the slate features a 9.7-inch LED-backlit IPS display with a resolution of 2048 x 1536, resulting in a pixel density of 264 PPI. The device draws its processing power from the new A7 chip with 64-bit architecture and an M7 motion coprocessor. On the back panel resides a 5 MP main BSI camera with f/2.4 aperture and HDR capabilities, and on the front panel is a 1.2 MP sensor for video calling. The tablet is offered with four storage capacities: 16/32/64 and 128 GB. While the new iPad Air delivers its “mandatory” specification upgrades, the main selling point seems to be the new design and the light-weight nature of the slate. 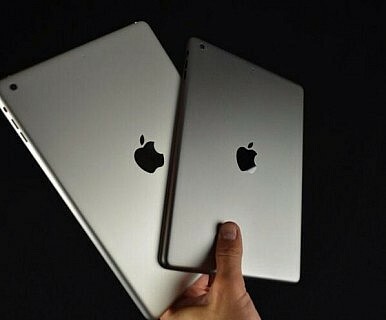 The iPad Air will be offered in two main color combinations, those being silver/white and space gray/ black. A gold model will not be released. As far as availability and pricing goes, the iPad Air is said to land on shelves in November, and Sprint’s CEO has already announced a November 1 release date for the new tablet. The Wi-Fi and Cellular model will set you back $629, $729, $829 or $929 for the 16/32/63 and 128 variants, respectively, whereas the Wi-Fi-only model will cost $529, $629, $729 or $829. iPad Mini with Retina Display – Better Than the First One? The original iPad Mini has been somewhat hit or miss. Actually, with the growing success of the Nexus 7 and the Amazon Kindle Fire tablets, the iPad Mini has been more of a “miss” than anything else. This was due to its low resolution display, the underpowered A5 processor, and the high price (at least when compared to the competition). This year, however, Apple seems to have learned from its mistakes. The new iPad Mini features a 7.9 inch LED-backlit IPS display with a resolution of 2048 x 1536, resulting in a pixel density of 326 PPI. In contrast, the older model featured a resolution of 1024 x 768, and an underwhelming pixel density of 163 PPI. In addition, Apple has decided to equip the new iPad Mini with the same, top-tier A7 64-bit processor that is found on the iPad Air and the iPhone 5s. More so, the new 7.9-inch device is also being offered with 16/32/64 or 128 GB of on-board storage. The Mini borrows the same camera configuration as its larger counterpart, and delivers a 5 MP main shooter, complemented by a 1.2 MP front-facing sensor. Much like with the iPad Air, the “Gold” flavor is missing from the iPad Mini with Retina color palette, as the slate will be offered only in space gray and silver. If you’re looking forward to buying the new iPad Mini, then be prepared to pay $399/$499/$599 or $699 for the Wi-Fi only model with 16/32/64 or 128 GB respectively. The Wi-Fi + Cellular variant starts off at $529 for 16 GB of storage, and goes as high as $829 for the 128 GB model. The new iPad Mini is expected to hit the stores in late November, and reports claim that the more compact slate will not go on sale within the same early time-frame as its larger sibling, due to stock issues. As mentioned above, with the announcement of the new iPad line-up, Apple has also announced a new OS version: iOS 7.0.3. This software update is a pretty big deal, especially for those who have reported issues with their accelerometer on the new iPhone 5s. The new software version fixes these problems, and includes new features, such as a password generator for Safari. It also fixes various bugs in iMessage, VoiceOver, and Siri. Are any of our readers excited about Apple’s latest announcements? Are you planning on purchasing either one of these tablets? Either way, feel free to share your thoughts on the new iPad Air and iPad Mini with Retina, and let us know whether or not these upgrades and changes are exactly what you were expecting or looking forward to. The Korean giant introduces two new tablets. How does it compare with Apple’s offering?